Nena Orescanin-Wicken has always been a natural athlete on the soccer pitch. She started playing soccer when she was 8 years old and soon after began competing and excelling at the highest regional level. Nena was an exceptional addition to the A.N. Myer Secondary School Girls Soccer Team. In 1985, she captained the team to an OFSAA gold medal. Nena's success wasn’t limited to soccer. In grade 12, she began to play for her high school rugby team as well as the Niagara Wasps Rugby Football Club. After high school, Nena continued to find success in both sports. While attending Wilfred Laurier University (WLU), she was co-captain of the WLU Varsity Women’s Soccer Team. The team won the Ontario University Athletics (OUA) title from 1990 through 1992 and the Canadian National Interuniversity Sport (CIS) championship, in 1992. Nena was recognized for her part in the team’s success as a four-time team MVP, three-time OUA all-star, two-time CIS All Star, President’s Award recipient, and in 1998, she was inducted into the WLU Hall of Fame. While at WLU, Nena also played rugby at the provincial and national levels. From 1988 to 1996, Nena played on the Ontario Women’s Rugby Team. 1992 marked the start of her career with Rugby Canada and over the following four years, Nena played in nine international matches including the 1994 Women’s Rugby World Cup held in Scotland. 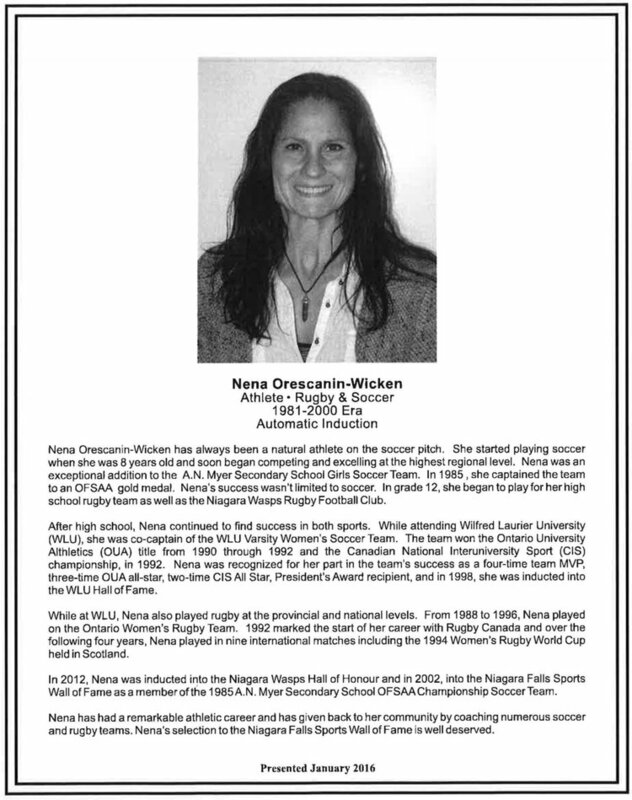 In 2012, Nena was inducted into the Niagara Wasps Hall of Honour and in 2002, into the Niagara Falls Sports Wall of Fame as a member of the 1985 A.N. Myer Secondary School OFSAA Championship Soccer Team. Nena has had a remarkable athletic career and has given back to her community by coaching numerous soccer and rugby teams. Nena’s selection to the Niagara Falls Sports Wall of Fame is well deserved.